InSight Mars Lander · Where is Starman? 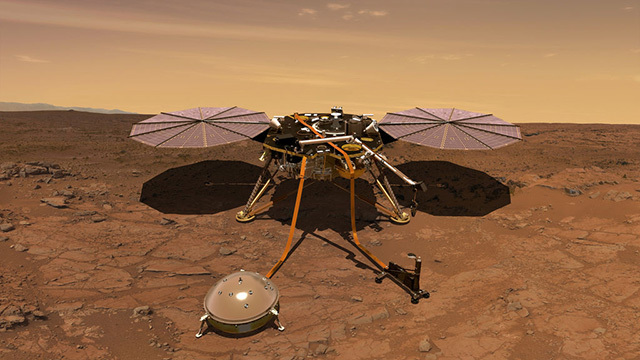 NASA launched a new Mars lander in May 2018, named InSight. InSight is not a rover, as Curiosity and Opportunity are, but rather a static lander. What makes this lander worthy of a trip to Mars? It is static because it has to be to accomplish its mission, which is to probe the interior of Mars. How will it accomplish that task? The same way we do it on Earth, by listening for Earthquakes (Well, Marsquakes, but…). The shaking ground can tell one about the interior of the planet. It is how we figured out what the different layers of the Earth are, as well as the Moon in Apollo days. One neat thing that is different about InSight is it launched from the West Coast. This typically isn’t done, and in fact, this is the first interplanetary mission launched from the West Coast. The reason is there is a slight gain in payload capacity if launching from the East coast, due to the rotation of the Earth. InSight does not need this advantage. Another fun thing is that InSight launched two miniature cubesats, called MarsCos. These are 6U cubesats, which will make them some of the smallest interplanetary payloads ever that can communicate directly with Earth. These are just experimental, but they could potentially assist with communication with InSight during the Entry, Descent, and Landing (EDL) phase. They will travel independently to Mars, and don’t have the propulsion to orbit. I haven’t proven this, but they might be the smallest interplanetary missions to fly separately to their destination. But where is this vehicle? It has safely landed on the surface of Mars, in the western Elysium Planitia, at 4.5°N 135.9°E, and is about 600 km away from the Curiosity rover. MarCo-A is 0 miles (0 km, 0 AU) from Mars, moving toward the planet at a speed of 0 mi/h (0 km/h, 0 km/s). MarCo-B is 0 miles (0 km, 0 AU) from Mars, moving toward the planet at a speed of 0 mi/h (0 km/h, 0 km/s). 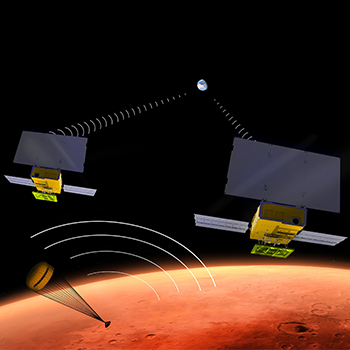 MarCo-A is 0 miles (0 km, 0 AU) from MarCo-B, moving toward the cubesat at a speed of 0 mi/h (0 km/h, 0 km/s).